There's no brighter way to say "Happy birthday" than with this one-of-a-kind birthday card. You can't beat those bright greens and yellows and pinks and purple, and the bold letters really scream out how much you care. This is a great choice for anyone in your life celebrating birthday, and it's the perfect birthday card to always have on hand. Just look at how adorable every detail of this birthday card is! As if the precious pup wasn't enough, the huge bowtie and fun party decorations make this celebration simply fabulous. The sweet sentiment of the words is the perfect balance for the loud nature of this birthday card, making it the perfect pick for anyone special in your life celebrating their birthday. 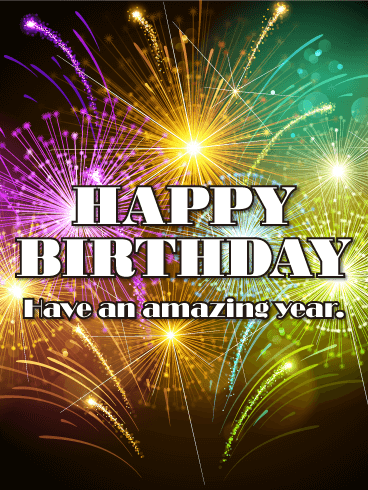 Add to the hoopla with this crazy awesome birthday greeting card! 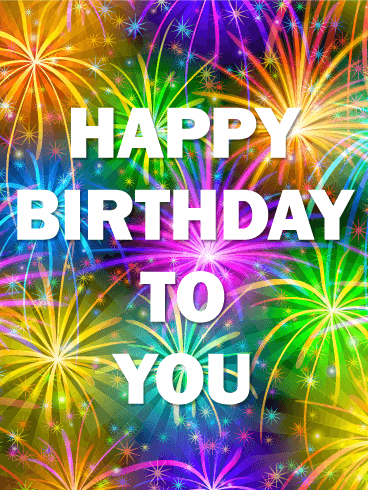 Send it to anyone you know who is celebrating a special birthday today. You'll be sure to make them smile and add an extra dose of fun to their day. Birthdays are days to revel in and celebrate with joy. Be a part of the happiness when you wish a fantastic birthday with a fun-loving birthday card. Birthdays are really too much fun. 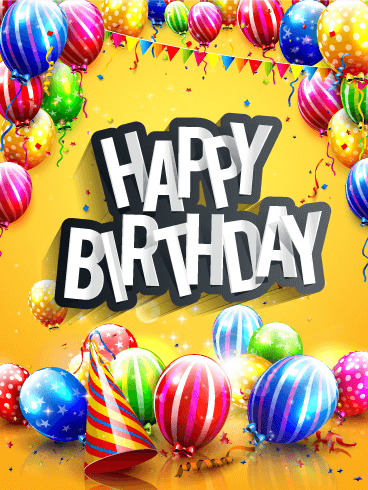 Be a part of the birthday magic when you send an amazing birthday greeting card. 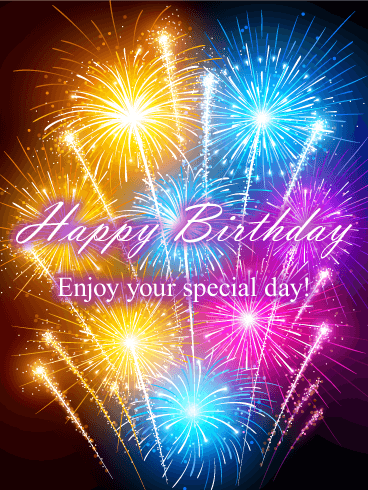 Light up a friend's birthday with birthday card filled with fireworks and color! It just takes a moment and you can send a thoughtful birthday wish to someone close to you that will transform their day! With this birthday card, you can truly help them make it a great day and an amazing year. Got birthdays? No sweat! You can celebrate anyone's birthday with a super festive birthday greeting card. It's fast, simple, and almost too much fun. 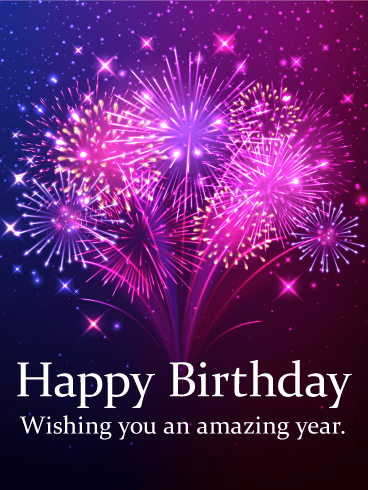 Wish a great day to someone dear to you with this vibrant birthday card. Balloons, confetti, and streamers, oh my! This greeting card is everything a birthday is supposed to be! 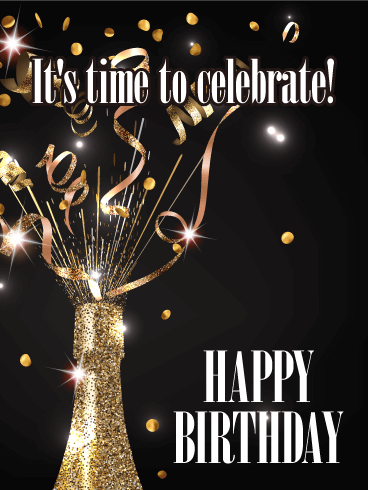 Get the party started and send this birthday celebration greeting card today! Cheers to an amazing year! Pop the cork and let the bubbly flow. Invigorate a birthday with a chic and modern birthday greeting card that is one part sassy and all parts classy. 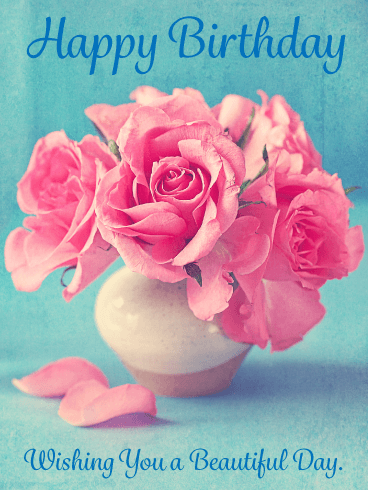 Send this festive and elegant birthday card to someone you know and help them celebrate their special day. 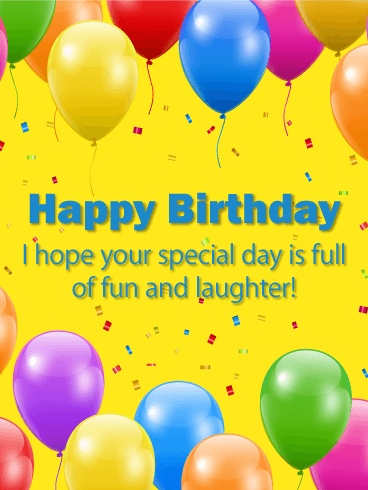 Unleash the fun when you send this bubbly birthday card! Nothing makes us happier than a bit of fun and laughter! It's the little things that count in life-good food, good friends, good fun. So send this fun, little birthday greeting card to warm the heart of someone you know. It's a perfect way to let them know you are thinking of them today. 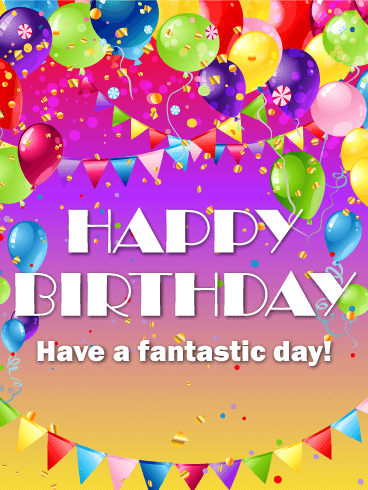 Send some warm birthday wishes with this bright and lively birthday card. Get the party started with this gem of a birthday card! 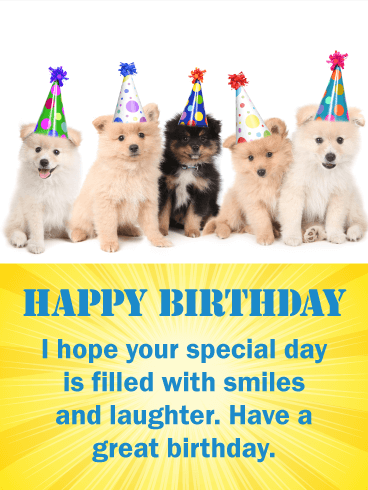 After all, who wouldn't want a birthday filled with adorable puppies and well wishes?! These pups are too adorable for words, especially with their fun party hats on. The sweet sentiment of this birthday card is the perfect addition and makes it a sure win. This birthday card takes the cake! Light up the candles and wish an amazing birthday to someone special today. It's fun. It's festive. It's totally awesome. Party balloons never fail to make us smile. Send this chocolate-licscious birthday greeting card today. Birthday greetings have never been easier! 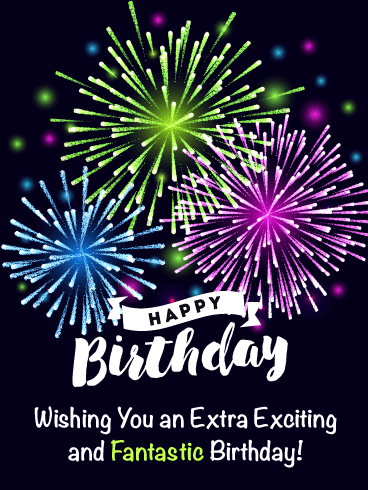 Be a part of the fun-send this amazing birthday card today! Here's to a fantastic day and an amazing year! A personal birthday greeting card is a thoughtful touch to anyone's special day. 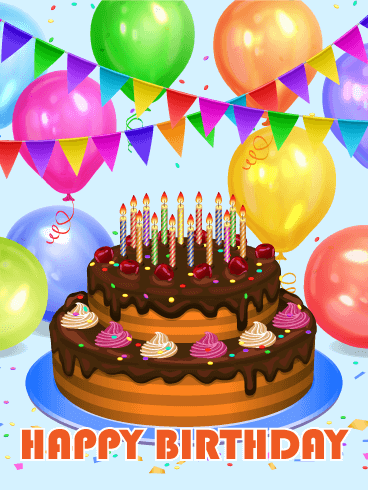 Don't wait another minute to wish someone near and dear to you a great birthday. No matter how old you turn, fireworks always turn you into a kid again and remind you to dream. This birthday card bursts with color, thoughtfulness, and good cheer. Who says fireworks are only for New Year's and the Fourth of July? Birthdays are an occasion worth celebrating with the best of them! Show someone you love them with this exciting birthday card. It's perfect for anyone-friends, family, colleagues, and neighbors alike. 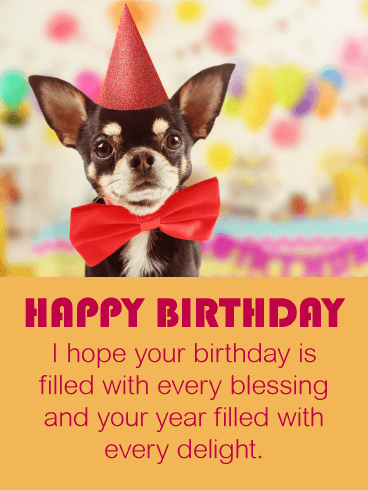 Send this birthday card to celebrate someone's special day!